With a recognisable look and feel refined over many years of use, familiar shortcut keys and enhanced functionality, WinPlus-IP is a simple and modern refresh of the industry standard prompting application. The default user interface is ideally suited for operation in dark production environments, with colours and content location able to be customised to the operator’s taste. The super smooth scroll preview ensures a clear overview of the prompted script at all times and improved features such as the font resize slider and prompt output indicator in the edit window make operating fast and intuitive. WinPlus-IP networks directly to all Intelligent Prompting devices, including controllers, monitors and the XBox-IP. A device status tool enables monitoring and management of all Intelligent Prompting devices on the network, as well as group updates that can be used to manage individual productions (dependent on user access rights). 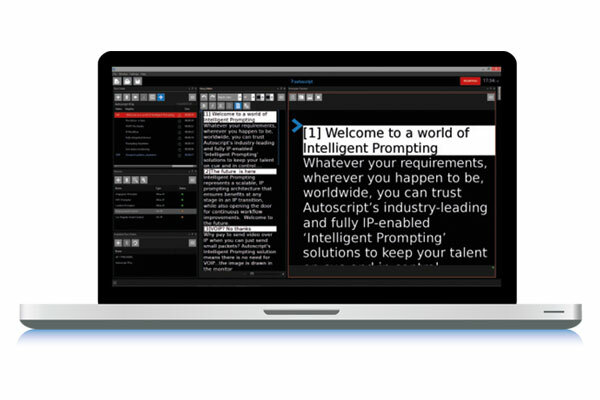 This latest upgrade builds on the reliability that Autoscript is renowned for worldwide. For critical live productions a full redundancy fail-safe is facilitated by the IP-enabled workflow, whereby a mirror PC can immediately take over from a failed PC without manual intervention. Simplified menus presented above the relevant content area, and user definable layouts, further add to the package to make this the most powerful prompting application available.